ST. PETERSBURG, Fla. -- Minor League Baseball today announced rule and procedure changes aimed at reducing the length of extra innings games and the number of mound visits during a game throughout Minor League Baseball. In addition, the Triple-A and Double-A levels will use a 15-second pitch clock with no runners on base. The procedures, created in partnership with Major League Baseball, aim to reduce the number of pitchers used in extra innings and the issues created by extra innings games, including, but not limited to, shortages of pitchers in the days to follow, the use of position players as pitchers and the transferring of players between affiliates due to pitching shortages caused by extra innings games. "We believe these changes to extra innings will enhance the fans' enjoyment of the game and will become something that the fans will look forward to on nights where the game is tied late in the contest," said Minor League Baseball President Pat O'Conner. "Player safety has been an area of growing concern for our partners at the Major League Baseball level, and the impact that lengthy extra innings games has on pitchers, position players and an entire organization was something that needed to be addressed." At all levels of Minor League Baseball, extra innings will begin with a runner on second base. The runner at second base will be the player in the batting order position previous to the leadoff batter of the inning (or a substitute for that player). By way of example, if the number five hitter in the batting order is due to lead off the 10th inning, the number four player in the batting order (or a pinch-runner for such player) shall begin the inning on second base. Any runner or batter removed from the game for a substitute shall be ineligible to return to the game, as is the case in all circumstances under the Official Baseball Rules. For purposes of calculating earned runs under Rule 9.16, the runner who begins an inning on second base pursuant to this rule shall be deemed to be a runner who has reached second base because of a fielding error, but no error shall be charged to the opposing team or to any player. Visits by coaches and position players will be limited based on the classification level. Triple-A clubs will be allowed six (6) visits per team, Double-A clubs will be allowed eight (8) visits per team, Single-A clubs will be allowed 10 visits per team and there will not be a limit on mound visits for Short Season and Rookie-level clubs. These mound visit limits will apply whether the game is scheduled for seven or nine innings. For any extra-innings played, each club shall be entitled to one additional non-pitching change mound visit per inning. Official Baseball Rule 5.10(l), which governs mound visits by a manager or coach, remains in effect (i.e., a pitcher must be removed on the second visit by a manager/coach in an inning). d. Visits to the mound after the announcement of an offensive substitution. In the event a team has exhausted its allotment of mound visits in a game (or extra inning) and the home plate umpire determines that the catcher and pitcher did not have a shared understanding of the location or type of pitch that had been signaled by the catcher (otherwise referred to as a "cross-up"), the home plate umpire may, upon request of the catcher, allow the catcher to make a brief mound visit. 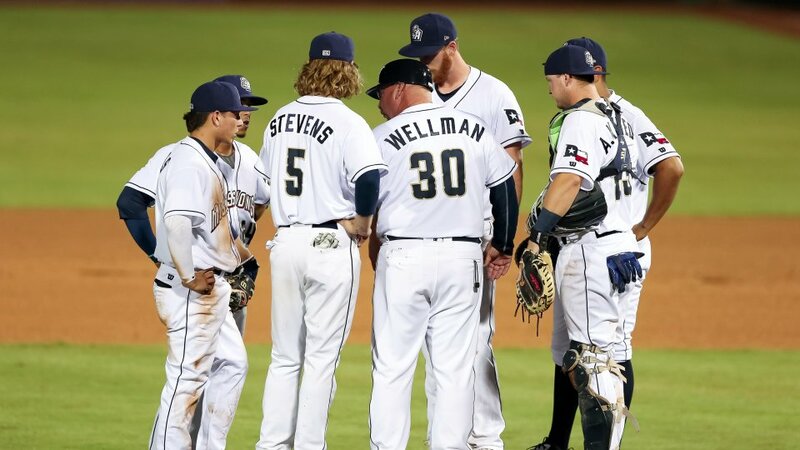 Any mound visit resulting from a cross-up prior to a team exhausting its allotted number of visits shall count against a team's total number of allotted mound visits. Pitchers at the Triple-A and Double-A levels will be allowed 15 seconds to begin their wind-up or the motion to come to the set position when no runners are on base. The pitcher does not necessarily have to release the ball within 15 seconds, but must begin his wind-up or begin the motion to come to the set position to comply with the 15-second rule with no runners on base. With runners on base, the pitch timer will go from 15 to 20 seconds. The timer shall start when the pitcher has possession of the ball in the dirt circle surrounding the pitcher's rubber, the catcher is in the catcher's box and the batter is in the dirt circle surrounding home plate. The timer will stop as soon as the pitcher begins his wind-up, or begins the motion to come to the set position. If the pitcher feints a pick off or steps off the rubber with runners on base, the timer shall reset and start again immediately. Umpires have the authority to stop the pitch timer and order a reset. Following any event (e.g., pick-off play) that permits the batter to leave the batter's box, the timer shall start when the pitcher has possession of the ball in the dirt circle surrounding the pitcher's rubber, and the catcher is in the catcher's box. Following an umpire's call of "time" or if the ball becomes dead and the batter remains at-bat, the timer shall start after the next pitch or play. Should the pitcher fail to begin his wind-up or begin the motion to come to the set position in 15 seconds with no runners on base, or 20 seconds with a runner on base, a ball will be awarded to the count on the batter. Should the batter fail to be in the batter's box and alert to the pitcher with seven (7) or more seconds remaining on the pitch timer, a strike will be awarded to the count on the batter. The first 15 days of the season (April 5-19), will serve as a grace period, with players receiving warnings for infractions. Beginning April 20, rules will be enforced as written. "We feel that limiting mound visits and decreasing the amount of time between pitches with no runners on base will further improve the pace of play and make it a more enjoyable experience for our fans," said O'Conner.